Every year since smartphones gained mass popularity they’ve been looked down upon as a product sales tool. Desktop converts better and it’s been that way for almost 10 years. The biggest mistake you can make is thinking people using mobile devices don’t matter as much to your store both online and offline. That’s like saying good customer service doesn’t convert well because the customer doesn’t buy from the customer service representative. Having good customer service is part of the conversion process. Without it, a customer may never buy. Smartphones are important to your sales conversion. A large portion of them will end up in your store or your website. Either that or they’ll end up buying your product because mobile still converts, just not as high. 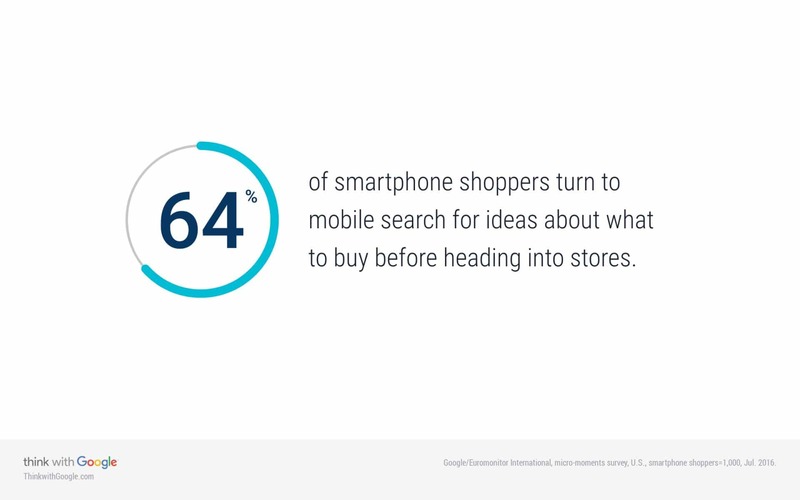 According to Google, 64% of smartphone shoppers turn to mobile search for ideas about what to buy before heading into stores. That means mobile is an essential part of converting visitors into customers. If that many people use mobile search to research products, why does desktop consistently convert better? It’s true desktop converts better than mobile. As the statistic above shows, mobile is still an important part of the conversion process, though. The same reason smartphones and mobile search have a place in connecting customers with your product, it also may be why desktop converts better. People often use mobile phones to do their research first and not necessarily buy right away. Mobile users are more often on the go and not ready to buy yet. They’re doing their research and just browsing at first. A desktop user has probably already done their research (on mobile) or they are relaxing at home in the mood to buy. A smartphone is an excellent browsing tool while a desktop is a better purchasing tool. When people are out and about they may do a bit of research here and there but there’s lack of time to make the final commitment. Once a customer has done their research they may sit down at the end of the day with their smartphone, laptop, and credit card in hand. That’s why desktop converts better but that scenario also is why it doesn’t matter. Real life converts better than a desktop but there’s probably not much research on that. That research would be hard to capture. When you’re in a store looking at products it’s easy to like something, grab it, and buy it. On the desktop you’re trying to visualize a products size, feel, materials but it’s hard. The temptation to be reckless and just buy it is diminished. On a mobile device people probably aren’t even looking at the details, they’re just browsing real quick, sort of like window shopping. None of those really matter, though. Each one is valuable in the purchasing process and they’re each highly dependent on the type of customer, product, and price. Not only that but focusing on just one or two methods to gain customers limits your ability to attract new customers. Every step of the conversion process matters and each path a customer could take matters. So, whether desktop converts better or in store shoppers do is irrelevant. What’s relevant is that you make it as effortless as possible for customers to buy from you. Removing barriers by being available where customers are makes your conversion process work better all around. If you miss out having your product researched (on mobile or wherever) then you’ll likely miss out on a sale too. Make sure you’re ready to have your product and business found and/or researched no matter where your customer is looking. It doesn’t matter if your customer is looking on their smartphone, desktop, or anywhere else. Your website and product depends on an easy to use website to convert people. Make sure you’re converting people however they research your business. Remove barriers because your customer is using their mobile phone, desktop computer, and coming into your store (if you have one). It doesn’t matter how they find you, it should be easy. You can request your free Online Presence Report to see how you’re making sure your business is easily accessible to everyone.